The year 2018 was not as fortunate for the cryptocurrency market as 2017. On the one hand, due to the market downfall, dozens of cryptocurrencies lost in value. On the other – this crypto winter helped to crystallize more strict rules towards industry regulations, and also triggered to leave those market players who are not ready to interact with the emerging realities. 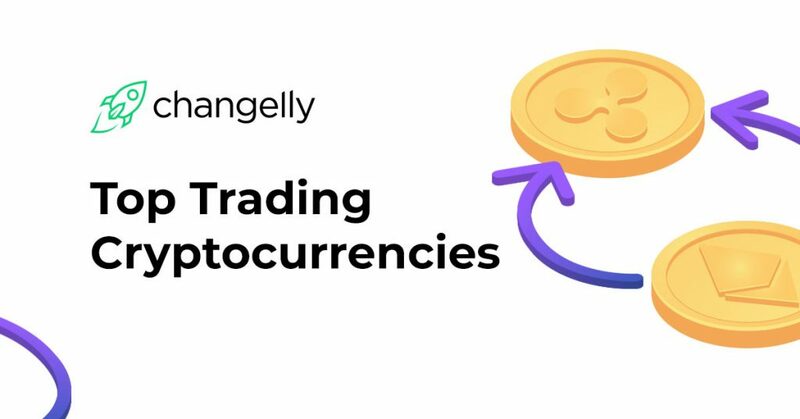 Changelly formed the ratings of the top-10 most popular crypto trading pairs along with the most sold cryptocurrencies and most bought cryptos of 2018. You are welcome to read this overview to find out what was this year like for the exchange service and its users. Hopefully, this overview will help you to make some useful conclusions or even to forecast your further behavior in the crypto field. 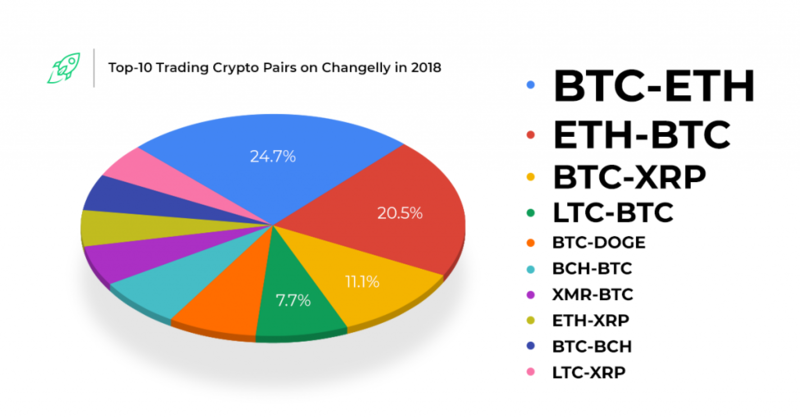 As you can see from the infographic, the first two places are shared between the BTC-ETH and ETH-BTC crypto trading pairs with the total exchange volume of 24.7% and 20.5% respectively. In the cryptocurrency market, all trading pairs usually contain these headliner currencies. This is explained by the fact that the crypto market participants keep their savings in BTC or ETH. Accordingly, when a person decides to buy cryptocurrency, which seems the most promising, he or she exchanges Bitcoin or Ethereum for the destination crypto, let’s say ABC. Thus, a crypto trading pair BTC-ABC or ETH-ABC is formed. Another crypto project which turned to be the rookie of the year is XRP. 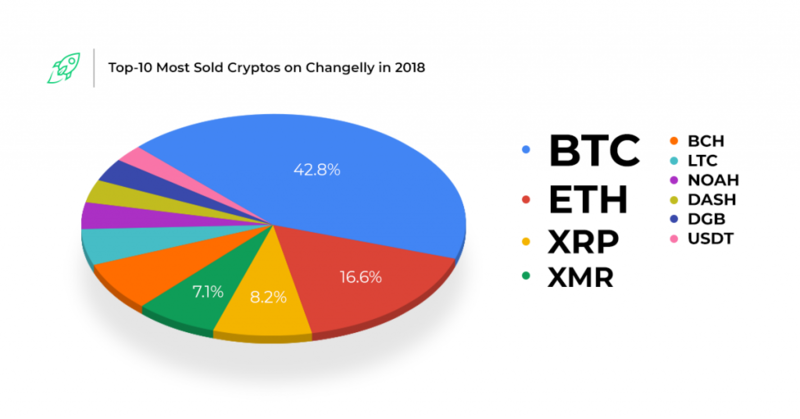 Crypto trading pair BTC-XRP takes the third place in Changelly rating. Also, XRP is still on the 3rd position in the cryptocurrency market rank. XRP started 2018 at the mark of ~USD 3.00, and during the year the rate was waving between USD 0.2 and USD 1.00. After the winter’s cryptocurrency market boom the next biggest hype around XRP peaked in autumn 2018 when the XRP market cap increased twice from US$11 billion to US$22 billion. However, there are more crypto assets worth paying attention to. Firstly, it’s the currencies which appeared as a result of a hard fork of the Bitcoin blockchain such as Litecoin. The virtual asset appeared as a result of BTC blockchain split in October 2011. However, the trading pair LTC-BTC takes the fourth stage in crypto pair rating and points the fact that in 2018 a vast amount of LTC holders preferred to exchange their LTC savings back to BTC. Despite all the ups and downs of the market along the previous year, the pioneer cryptos didn’t change. Such giants like Bitcoin and Ethereum formed the entire industry in its roots, so along 2018 BTC and ETH were keeping the leading positions as the most sold and bought assets on the crypto market. The fourth position goes to Monero or XMR with a total selling volume of 7.1%. As you probably know, Monero distinctive feature is total anonymity. On the one hand, this is the superpower of cryptocurrency which has been moving the blockchain industry forward from the very beginning. On the other hand, the time has shown that the abuse of anonymity became a disruptive power, following increased incidents of using Monero for money laundering. Thus, the decision to eliminate Monero from Changelly was motivated primarily by security reasons. As you can see from the diagram, Monero takes the 4th position in the top-10 most sold cryptos on Changelly even though the asset was switched off from the service in autumn 2018. The last but not the least cryptocurrency in Top-10 most sold cryptocurrencies rating is USDT. The first stablecoin pegged to USD fiat currency caused quite a stir along 2018. A sharp drop in price occurred in the middle of October 2018. Anonymous attackers provoked the accident to increase the price of other cryptocurrencies. There’s an interesting observation if to compare diagrams with the most sold and most bought crypto assets of 2018. In both cases, BTC and ETH took the 1st and the 2nd places respectively. However, along 2018 the trend to sell Bitcoin contrasted with the trend to buy Ethereum. The total value of sold BTC is 42.8% against 16.6% of sold ETH, while the chart of the most bought cryptocurrencies shows only 34.5% of BTC against 24.3% of ETH. There is another prominent altcoin we haven’t mentioned yet. Bitcoin blockchain split made much noise back in 2017. As a result, the new cryptocurrency BCH was born. The hard fork took effect on 1 August 2017. In November 2018 Bitcoin Cash was hard forked again and split into Bitcoin Cash and Bitcoin SV. The confrontation of two communities surrounded the occasion. Following the network split, BCH market cap dropped dramatically. However, starting with the middle of December 2018, the market volume was partly compensated. The fourth place in the most bought cryptocurrency rating takes Litecoin. 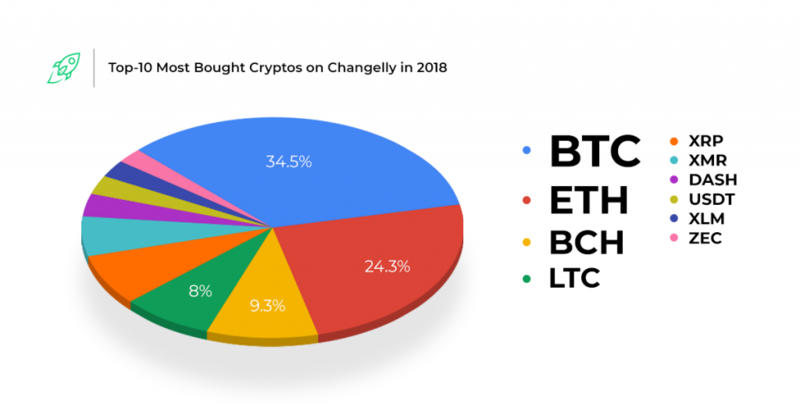 Despite the descending LTC price trend along 2018, 8% of Changelly users took their chance on Litecoin. And as we can see now investment in LTC back in 2018 paid off at the beginning of 2019. As the Litecoin price increased almost three times from the beginning of the year. To sum it up, let’s take a look at all the graphics once again. What do we see? Moreover, following the research, we can see that there are a lot of long-standing cryptocurrencies that take place in the top-10 rating. No matter the hype, such factors like the technology behind the crypto, and the time of cryptocurrency existence can make it worth investing. After all, the cryptocurrency market is still forming, and there are a lot more promising crypto projects to come. There is always the only one golden rule: keep calm and do not let emotions to rule your crypto behavior. Also, to keep abreast of cryptocurrencies further behavior read cryptocurrency price prediction articles in Changelly blog. Good luck with the further crypto investments and have a nice swap!